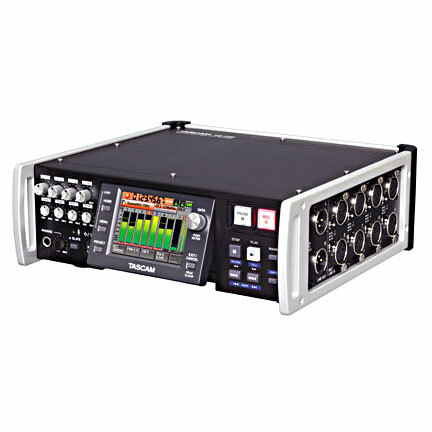 TASCAM’s HS-P82 offers 8 tracks of the highest quality recording, yet it’s built for the rigors of location recording with reliable solid-state performance. The HS-P82 is built for location television and film production audio, with eight microphone inputs for big shoots or reality programs. The standard XLR microphone inputs include phantom power and analog limiting, with trims controlled from recessed front-panel controls. In addition to the eight individual tracks, a stereo mixdown can be recorded for instant use during editing. Audio is recorded at up to 192kHz/24-bit WAV format to a pair of Compact Flash cards. This solid state media is completely reliable with no moving parts, and you can record to both cards simultaneously for extra security. The Broadcast WAV files include iXML metadata for quick import into nearly any video or audio editing system, either via the USB 2.0 connection or a standard card reader. The HS-P82 offers several options for power. It runs on either AA or NP batteries, an included AC adapter, external DC input or a V-mount adapter for Endura batteries. An internal slate microphone is available for naming takes. Functions like a 5-second pre-record buffer, front panel lockout and headphone output alert signal further inspire confidence. For high-resolution music recording, a set of AES/EBU connectors is available for attaching pedigree A/D converters and preamplifiers. SMPTE timecode in and out, video and word sync are provided. All of this is controlled from a color touchscreen interface which makes operation fast and simple.